Trees are an essential component to any outdoor area, as they provide essential shading and screening, not to mention a healthy dose of greenery that gives the garden texture and depth. Most Australian homeowners are familiar with the term “tree lopping” and while you might think that lopping is something to be carried out at certain times of a tree’s life, research suggests that this practice is actually harmful to the tree. According to the Tree Protection Act of 2005, it is illegal to lop a tree, and their definition of lopping is to make cuts at the fork of a tree between the branch unions, while the correct practice, pruning, is to cut branches after the union, which allows the tree to develop in a healthy way. Lopping a tree is likely to cause severe xylem dysfunction and decay in the major branches of the tree and this will result in the tree forming a layer of new wood around a decaying core, which can be very dangerous. If a mature tree actually survives the lopping process, it will require very careful management as the tree develops, with extra weight being added by the new growth, while the dysfunctional inner core is not able to hold this extra weight. Rather than cutting off a main branch, the branches that run off the main bough can be trimmed back to a point just after the branch union and this achieves the objective, yet does not harm the core sections of the tree. If you think your garden trees need some attention, source an eco-friendly arborist and one that understands that tree lopping is not advisable under any circumstances. If the tree is in a bad condition, perhaps removal is the best solution and with stump grinding, all remnants will be removed and you can use that patch of ground for something else. 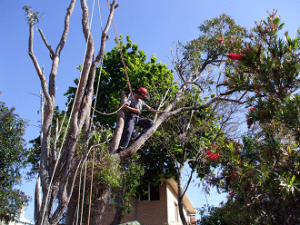 While there might be many companies offering tree lopping in Perth, look for one that complies with the Tree Protection Act and therefore does not practice tree lopping – which is also known as tree topping. A qualified arborist will employ pruning techniques to reshape a tree or remove dead branches, which is not harmful, in fact, correct pruning promotes healthy growth. An arborist would know how a tree can be cut back without causing damage and always has the tree’s best interests at heart. Shaping can be carried out in such a way that the removed branches will not hinder healthy growth and rather than simply taking away branches to achieve the desire shape and size, the arborist will only remove what he can without harming the tree. There are cases when tree removal is not the best solution and if the tree is old, then lopping is a manageable way to help the tree finish its lifecycle. The lopping would be a precursor to removal, which might be scheduled a few years from now, yet the instances when tree lopping is suitable are rare indeed. Large trees can weigh anything up to 50 tonnes and lopping such a tree could very easily put people and property at serious risk. There would be no outer signs of a problem, as the core timber is decaying slowly, and with so much weight to support, some species simply crack under the strain, sending a bough of a few tonnes crashing to the ground. Once you have managed to locate a qualified arborist, it is advisable to let him schedule any tree work that needs to be done. He would know the best time of the year to prune back and would ensure a balance of natural beauty and good health. Previous Previous post: Is it Safe to Garden Near your Septic System?